and most importantly, we’ll give you the code. Yes, we realize there are tools that exist that can help you with this question, such as Crazy Egg’s scrollmap feature or ClickTale’s scroll reach heatmaps. These tools are great, and we use them frequently. However, some clients don’t have access to these tools, and we want to see this data inside Google Analytics. When you have the data in one place (within Google Analytics), it is easier to create segments and see how scroll impacts conversion, engagement and other on-site behaviors. If you’re using Adobe Analytics (aka SiteCatalyst), the getPercentPageViewed plugin is your best tool. The concept is very similar and the data uses provided below are applicable in SiteCatalyst as well. You should also check out Justin Cutroni’s great post on measuring on-page scroll/content tracking. This is a valuable, but different technique from what we are discussing in this blog post. Justin’s post is about firing events when a user gets to an area of the page. This blog post is about measuring the maximum scroll percentage of that user and for a specific page. This leads to simpler, more actionable reporting. This method of scroll depth tracking is easily used with Tag Management. Being an analytics geek, I love data (all kinds). I recently purchased a device called Automatic that connects to my car and collects data from my vehicle’s data port. It connects to my phone and a beautiful app shows me data about my driving behavior. To illustrate the value of scroll tracking, let’s take the Automatic website as an example. Go ahead and open the site so that you can see how long of a page it is. Welcome back…it sure is a long page, eh? Great design and lots of important information, but it (currently) measures in at 5,887 pixels tall. Do users that see more than 90% of the page convert more than those that don’t? My intuition says that is true, but I want the data. If they see more than 90% of the page, that means they’ve seen the parking location feature. Perhaps this data could lead to an A/B test to determine if the parking feature should be moved up so that the users that view more than 50% of the page see this feature. Of the users that view the blog after viewing the home page, what percentage of the home page did they see? Do users that watch the video(s) tend to view the entire page? Hint, these are your highly engaged (methodical) users and want to know everything before they purchase (that’s me). If there was a call to action at the bottom of the page, what percentage of our users see it and should I consider moving it up higher? Okay, these are just a few examples of conversion rate optimization questions you could ask. Guessing that you are starting to see the value in tracking this scroll depth data for all your site content types (e.g. home page, category pages, detail pages, blog posts), right? If you want to ensure this data is actionable, we recommend tracking by quartiles, quintiles, or at the most deciles. Otherwise, if you track too small an increment, you will have a hard time spotting trends in your data. In determining what is best for you, make sure you consider factors such as your site’s volume of traffic, typical page length, and whether or not you have any consistency in logical content sections. We’ve written a plugin that is very easy to implement (in fact, if you are using a Tag Management Tool, you could get this implemented in a matter of minutes). We do recommend that you place this in its own tag within your tag management solution like GTM (Google Tag Manager). You are welcome to take and modify the code to fit your needs, but I think you’ll find that what we’ve provided is quite flexible. When the page loads, we immediately capture the visible position of the page and calculate the percentage of the page that is visible. When the user scrolls and stays in position for a certain duration (this is configurable), then we do the same and capture the visible percentage of the page. At any point that this percentage is calculated, we record the numeric value in a cookie only if it is greater than the previously recorded value. Also recorded with each cookie write is the page URI. This is important and is explained further below. This plugin has configuration options (covered below) and a callback method to grab the maximum scroll depth percent on a page at any time. 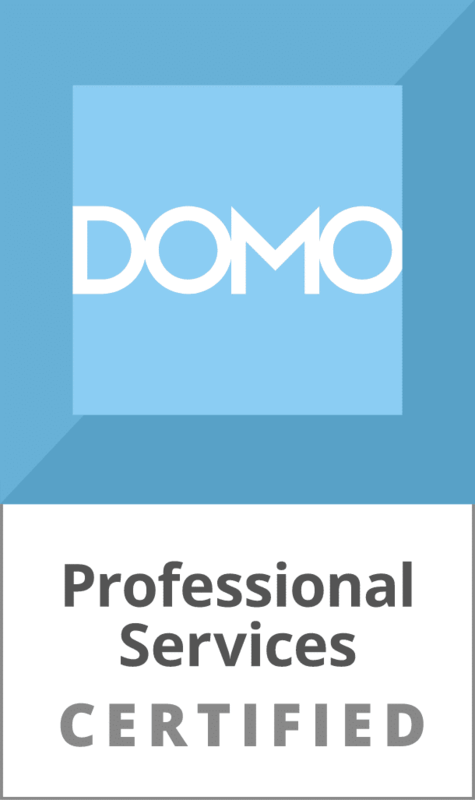 We provided code examples/best practices to grab the result and output it to Google Analytics. First, the plugin code. We host and link to this on BitBucket to keep it current and up-to-date with the latest changes. Please download or pull the repo from our BitBucket. The default behavior of this plugin will be to capture the max scroll percentage value on the subsequent pageview. 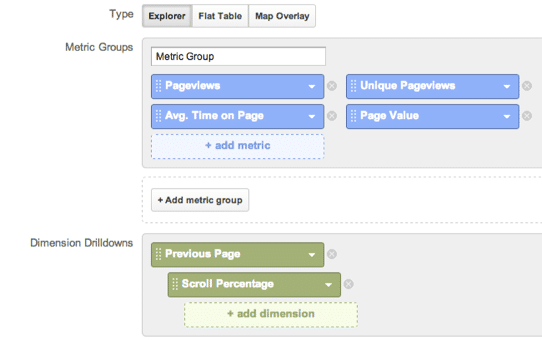 This means that if the user exits on the page in question, we won’t capture data on the percent of page viewed. To combat this, you could hook in the callback call with your external link click tracking function to set a custom dimension with an event when the user clicks on an exit link. In the report data, we capture the previous page URI so that you can correlate percent viewed (since we send the data on the subsequent pageview). This also gives you a dimension of data that shows the previous page URI of any hit-level dimension. If you use a technology, such as ajax that doesn’t fire a pageview or execute the script each time, you can simply grab the callback data and determine when you want to send the data. I’m Capturing the Data, Now What? Let’s say you decided to use the labels “Previous Page” and “Scroll Percentage” for your custom dimensions. How do you get to the data? Using the Scroll Depth Custom Report that we just showed you how to create; you will select a page (e.g. www.domain.com/services) and then you will see a detailed scroll percentage breakdown report like this. The next thing I wanted to do was create a segment of visits that saw the /about page and also scrolled to at least 50% of that page. This is surprisingly difficult in Google Analytics since hit-level segmentation is not possible (only visit and user level). If this is important, you need to combine the data into a single dimension. 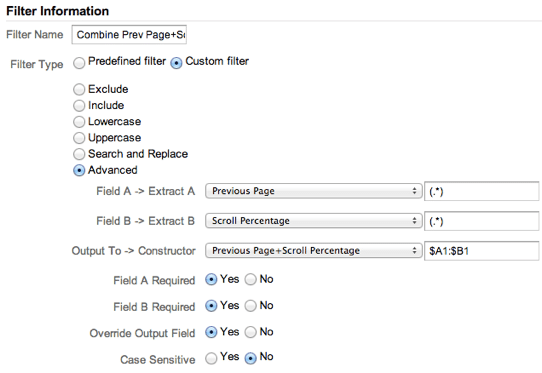 In Universal Analytics, you can simply create a custom filter to do this (or you could edit the code). Here’s the custom filter for this, where the output would be something like ‘http://www.mydomain.com/about:50’. We hope you use this scroll depth tracking data to make more informed decisions. If you need help understanding the data and taking the next step (or implementing this tracking code), we are available to help. Do you have ideas for the next plugin we should write for the analytics community? If so, leave a comment below. Hello, when I downloaded the file where should I put it in google tag manager or in google analytics? I am sorry for this question just I think its brilliant solution and would like to use it, but do not know how to implement it to the site. Agreed. Would love to see more of a step-by-step solution. I see this fires – in the example code – in an ‘onload’ event. for a single page website format – how do you get it to fire when you scroll? Very cool. I think this will be a win for me when I can figure it out. One thing I’d want to do is to sort on percentage rather than on views. (left column in report is in order) This can indicate where the reader lost interest. On potential problem: Comparing pages with different lengths. If a page is only 1 screen high, then all viewers that stay on it more than N seconds count as 100%. 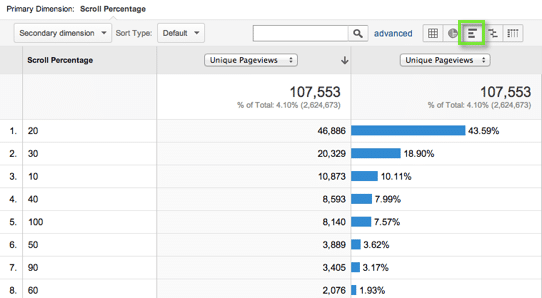 If you are trying to measure “Interest in page” you want some sort of screen count. E.g. if the page is 5000 pixels long, and the user’s screen is 800 pixels long, then the page is 6+ screens deep. You want to record how many screens the user loaded. This may be of interest when comparing desktop and mobile viewers. One other thing: I can get all sorts of numbers about my site. But it’s not clear what they mean. I’d love to see a series of blog entries about types of sites, and how to interpret the analytics. This is great! I wonder, is it possible to set it up so that say 25% is a non interaction event and everything above 25% counts as an interaction? I’m thinking about bounce rate here. Hey, Joe, I don’t suppose you made any progress on the GTM guide for Scroll Depth, did you? I ran into an issue when I was creating my custom report in Google Analytics. I can’t find both Previous Page and Scroll Percentage in the Dimension Drilldowns. How do I make them appear? Quick question, how do you determine what part of the site is 10%, 25%, etc.? And place this in GA proper as custom dimensions? Hello Joe, is the step-by-step setup in GTM already published? Very nice, but what if cookies are not allowed? Couldn’t be a session value be a better solution? thanks for this brilliant article. I am new at Google Tag Manager. I have already successfully installed the Scroll Depth tag and I’m in the process of analysing my results now. So, I have noticed that there are occasions where for instance the number of users that scrolled down to 75% is higher than those who scrolled down to 50% – That looks a bit odd to me. Is it possible the percentage to be affected by users’ scrolling speed once they land on the page? Any thoughts/advice would be very much appreciated.